As a mom of two young fashionistas, I understand the importance of wanting to always look your best. My girls LOVE clothes and we’ve had many fashion shows here where they model their new outfits. I think they get it from their grandmother who loves fashion! I recently discovered Souris Mini and was so impressed. Since we live in a somewhat rural area, I often find myself shopping online versus driving 160km to the city. Honestly, I prefer online shopping anyways because of the convenience of shopping at home and better selection. There’s a whole world of shopping at your fingertips. Take Souris Mini, for example, and its newly revamped website. They sell children’s apparel from age newborn to 10 years old and have a beautiful website with an array of fun, bright and stylish clothes for kids. Though my kids are older now, I have a young niece to shop for and another nephew on the way in August. I know where I will be going to shop so Auntie can spoil them with some new stylin’ threads. I was telling my sister about Souris Mini and the reasons why I thought she would enjoy shopping there for her kids’ clothing. I’m also sharing those 10 reasons with you today too! Get ready to learn more about Souris Mini and why you’ll want to shop there for your children’s clothes. 1. They design clothes that are fashionable, high quality and comfortable. Souris Mini focuses on one market, children, and therefore, ensures that their clothes suit children’s lifestyles and meet their needs. I look for these three factors when I shop for clothes for myself and my kids. It’s great that Souris Mini understands their importance! 2. Shopping online at Souris Mini is an immersive experience. Try it out and you’ll see what I mean! 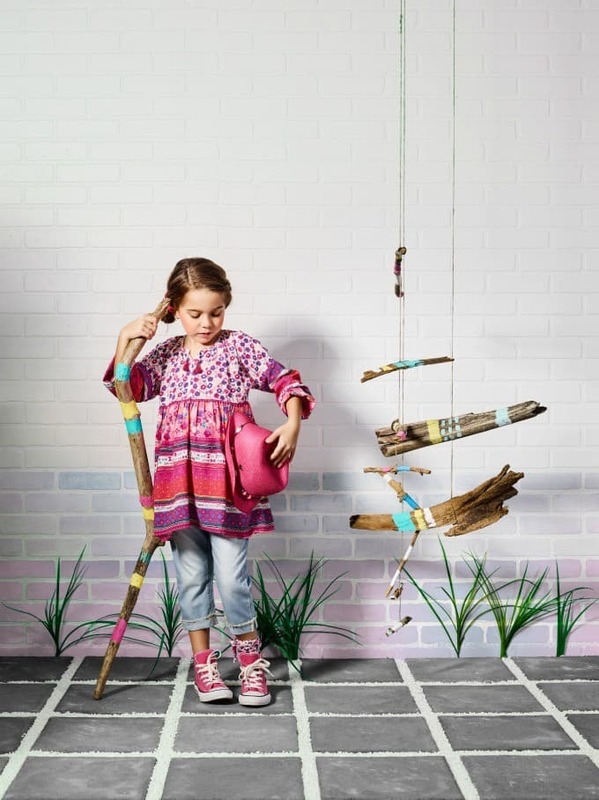 As you browse through the brands playful and colourful collections, you’ll be able to quickly choose your favourites and be able to easily imagine your child wearing the items. Collections include clothing, accessories, swimsuits and more. 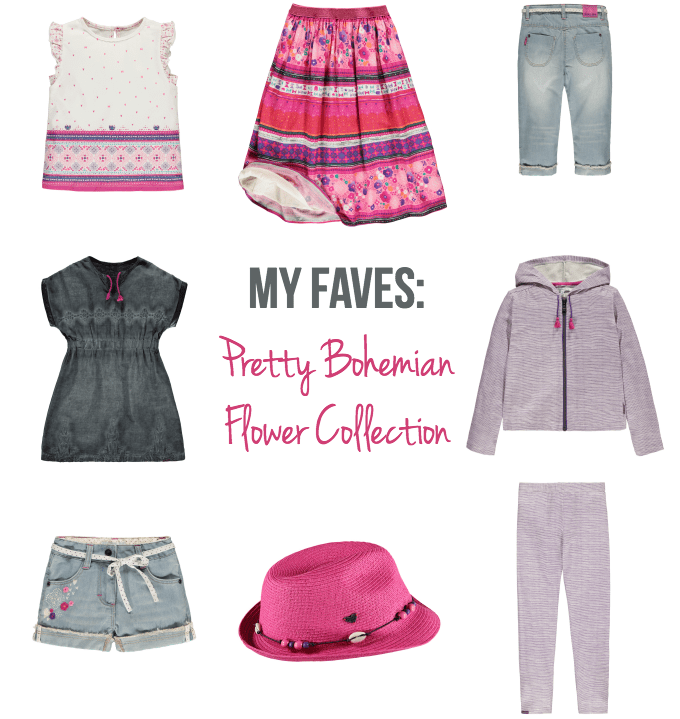 The Pretty Bohemian Flower Collection is one that first caught my eye. I fell in love with the whimsical and fun designs and am planning to buy my niece a few pieces for her birthday in May. Shhhhhh. 3. It’s simple to mix-and-match looks in each collection. New filters make shopping even easier. For instance, I selected the Long Sleeve Printed Tunic from the Pretty Bohemian Flower Collection and saw the suggestion to pair it with the denim 3/4 pants. It saves me a bit of time in making a decision on what to buy! 4. What you see is what you get. What I mean by this is that you can easily tell what the clothing looks from the images online right down to the smallest details in embroidery, colours, textures and more. I love the big, high-quality images making it easier for me to zoom into inspect the small details. 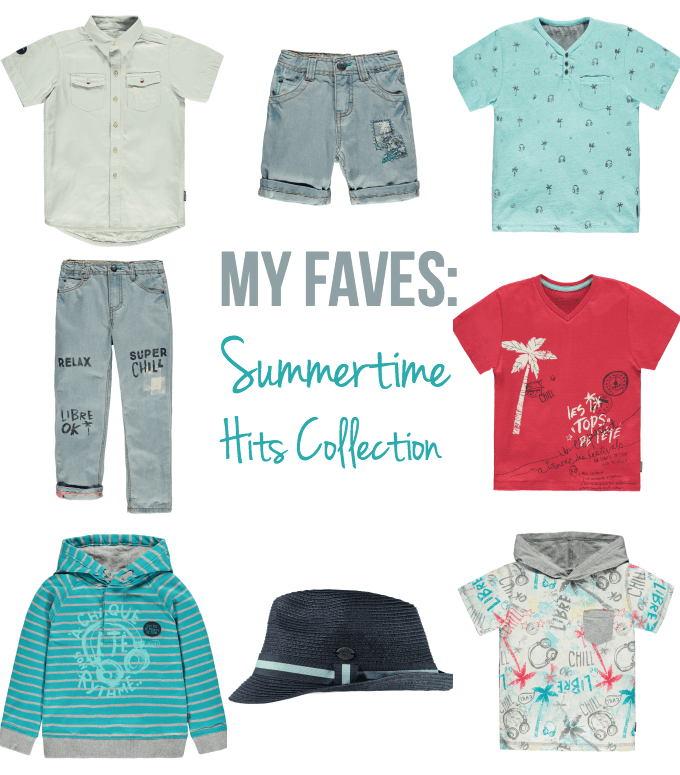 Take a closer look at the Summertime Hits Collection for boys and you’ll understand what I’m talking about here. 5. Mobile responsive site. More and more people are shopping from their smartphones and tablets making a mobile friendly site a must. Souris Mini has a responsive navigation for you to browse the collections and shop without having to be on a laptop or desktop computer. 6. Easy to access customer support. Have a quick question as you are browsing online? Contact Souris Mini customer support via their toll free number or email. You can also look at their FAQs to see if your question is answered there. 7. Fashion advice in the On-Trend section. With a quick scroll, you’ll be updated with the season’s key must-have items. I love how they’ve paired items together so you can buy the whole look! 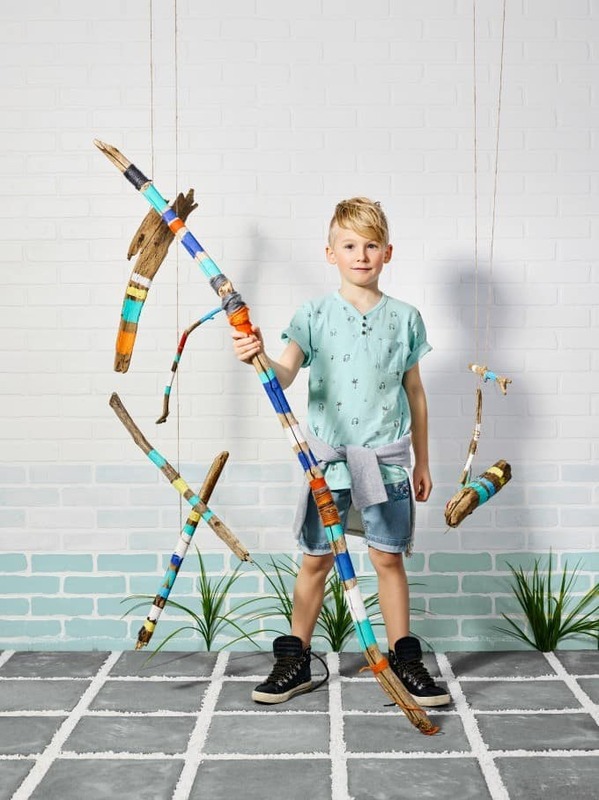 As an added bonus, they also have some fun DIY projects you can do with your kids. 8. Souris Mini is Canadian. They were founded in Quebec City in 1989 and have 30 physical stores throughout la belle province. Their website makes it easy to shop online no matter where you live in Canada. They also ship to the USA. I love shopping in Canada because it means no exchange rate difference and no customs fees. Plus, it’s great to support a Canadian business. 9. They offer free shipping when you spend $75+. Souris Mini ships via Canada Post. If you don’t spend $75, they have a flat rate of $9 for shipping. When I’m shopping online, I seek out free shipping so take note of this policy. 10. They support an important social cause. Souris Mini has joined forces with Leucan to fight cancer. They donate all proceeds from every gift box sale to the cause. 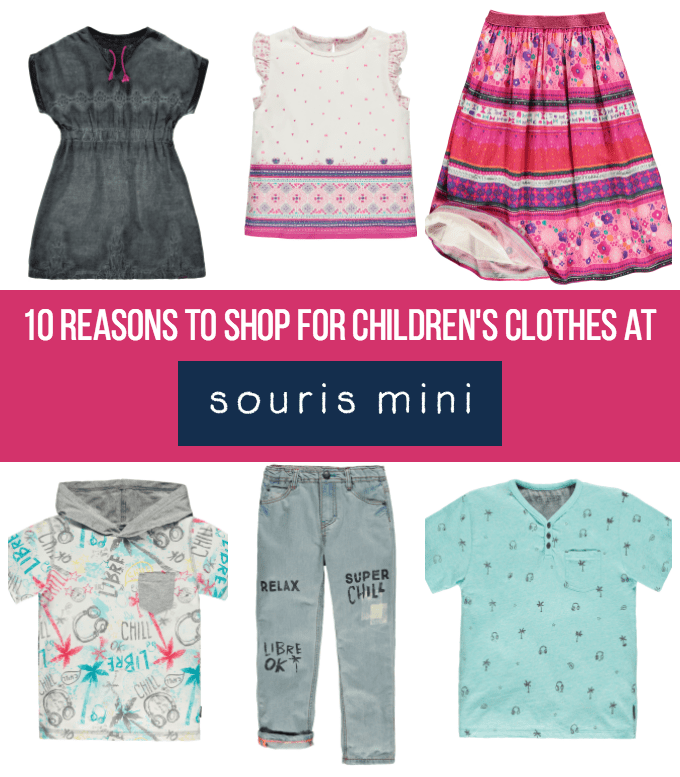 Bookmark Souris Mini or this post so you’ll remember to visit next time you are shopping for clothes for your kids. I’m excited to buy my niece a new spring outfit. I can’t wait to see how cute she will look in it! What is your favourite item on Souris Mini? Connect with Souris Mini on Facebook, Pinterest, YouTube and Instagram. I love the hoodie that you also featured! SO CUTE! Our little guy would look so cute in that! I love the Smooth Sea collection and I know my girls would be so excited to have the Belted Short Sleeve Dress! I think the girl’s Collection Hopeless romantic blue and white Short Sleeve Printed Blouse is really pretty from Souris Mini. Simply stunning fashions for kids, i’m so impressed!!! I love the Terry “Swim Cover-Up” Hooded Dress, so adorable! I like the long sleeve tunic from the bohemian collection. I love the sleeveless Bohemian dress. So many cute clothes! I like the color of the zip swandown cardigan under sweet little flower’s line. I think it would look darling on my little girl! The Poplin and Tulle Ruffle Skirt is definitely my favourite. My daughters would love it. That bohemian collection is fabulous! I love the long sleeved tunic. Love the softshell hooded coat for my son! I love the Poplin Sleeveless Printed Dress. The print is really great. I think my daughter would love the Poplin and Tulle Ruffle Skirt from the Downtown with Girlfriends collection. My favorite item is the English embroidery and chiffon ruffle skirt. I would love to win the gift card for my baby girl due in May. I would get some Footed Jersey One-Piece. This pregnancy was the worst never felt well enough to shop. She is due in less then 40 days and no clothes!! I like the Poplin and Tulle Ruffle Skirt but dd would love the Slim Fit Swandown Overalls! My favorite is the Coated Twill Hooded Coat in blue. I like the Diamond Brocade Button Up Cardigan and the Sleeveless Poplin Dress. I love their PJs and Coated Canvas Hooded Coat. I like the boy’s Oversized Stripes T-shirt. I like the terry rabbit security blanket. I like the Printed Windbreaker Coat for boys. I like the Double Jersey Hooded Sweatshirt. I like the “All abord” boys line, especially the sweater! I like the short sleeve bubble dress. Such cute designs! I like the English Embroidery ruffle dress. They are all very cute. I love the dresses. My favorites are the sleeveless bohemian, ruffled and oversized dot versions. I like the sea flower rashguard swimsuit. i like the pretty bohemian flower look, it’s so cute. My favorite is the bodysuit set for newborns. My favorite is the Skirted One-Piece Swimsuit. I love the Denim Pinafore Dress!